Nina has always dreamed of being a star. Unfortunately her agent thinks she’s more girl-next-door than leading lady and her acting career isn't going quite as planned. Then, after a series of very public blunders and to escape a gathering storm of paparazzi, Nina is forced to flee from London. Cathy Bramley is taking us on a new adventure to Brightside Cove in Devon. Our main character is Nina, an actress who has just made a terrible mistake and needs to lay low for a while and so she plans to spend time with her brother but life has a different plan for her when she is reunited with a blast from the past who is in desperate need of her help. As Nina spends time away from London and the glitz and glam will she be itching to get back to the life she has known or will Brightside Cove steal her heart? I have loved each and everyone of Cathy Bramley’s previous books and what I love is that she creates such strong and determined women who start community ideas or businesses from scratch and we see the businesses develop from a seed of an idea to a great success but with lots of hard work and ups and downs along the way which make the storylines believable and this is the same for A Match Made in Devon. I loved how the author caught me out as I was merrily reading along thinking what a wonderful storyline even though the romance was predictable, only to then be thrown off the path. Although the storyline has a fun modern and a little splash of glam to it there is also some very tender topics weaved into the storyline that was written with such care and insight especially with regards to what Theo and Kate had been through. This gets another thumbs up from me, pure romantic escapism with courageous and determined characters who I loved. 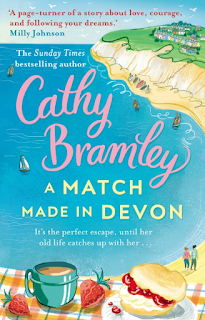 A Match Made in Devon is out in stores now so don't wait go and grab your copy.